…and many more organ trios. Maybe even too many. Don Mock is one of the founders of GIT in Hollywood. I still recommend his Artful Arpeggios to folks. I was thrilled to find his version of Thelonious Monk’s jazz standard. Tim Lerch has an absolute ton of solo guitar videos on uTube, here’s his version of Round Midnight. For comparison, here’s the composer performing it with his band. A brand-new Yamaha grand piano with a MIDI output has just arrived at the Sri Moonshine Ranch, out in the hills, elevation 2000 feet, three hours from San Francisco toward Lake Tahoe. Terry Riley says, “It’s the first good piano I’ve ever gotten.” That’s an amazing statement coming from one of the world’s foremost keyboard improvisers, equally at home in ragtime, jazz, rock, Indian, classical, and minimalist idioms. First thing he’s going to do is retune it to an exotic, Arabic-sounding mode, so he can record his Piano Quintet with the Kronos Quartet. But before he gets that chance, he’s coming to New York (see article’s end for details). Columbia planned a Young release concurrent with “In C”. Young and Marian Zazeela singing in response to the resonance of the ocean at Westhampton Beach. Then, the day they tried to record, a gale ruined the sound of both singing and ocean. Young wanted to retape, Columbia’s producer wanted to save money by dubbing a new ocean recording beneath Young’s voice, and the disagreement killed the project. As the winds of fate had it, Riley became a cult figure on the pop periphery, while Young stayed in the shadows until his 1987 Gramavision recording of “The Well-Tuned Piano”. Nevertheless, there’s no Riley-Young rivalry, unlike the bitterness between other innovator pairs like Boulez-Stockhausen, Reich-Glass, and Chatham-Branca. “My music,” Riley admits, “got a wide acceptance before people were hearing about La Monte. Certainly he was a big inspiration for me, especially the stuff he did with his early group, with Tony Conrad, and John Cale. I think La Monte’s creation of a form from just scalic elements–just scales or patterns, like you find in the East–was a forerunner for all the forms I worked with during that period. It inspired the formal element in my music. From me, it filtered down to other composers but I was recorded first. “I’ve always admired Young’s one-pointed approach. Very few people can work that way. It points to what music is striving for in a basic, elemental way. Many of the rest of us have tried to do it through other means, to get into that very deep feeling. He’s a very deep soul.” Riley may be, too, but he can’t stay in one place like Young. The friendship’s still intact, but Riley’s wandered from the primeval tone to many stylistically distant points. Starting out in cool, nonmodulating, modal improv, by 1971 Riley made a minimalist-flavored rock disc with John Cale, “Church of Anthrax”. The ’70s records include stunning, jazzy scores for European films, Alexander Whitelaw’s “Le Secret de la vie” and Joel Santoni’s “Les Yeux Fermes”–good luck finding them in used-record stores. Riley nearly disappeared from public view in the late 70s, due, he says, to his teaching responsibilities at Mills College from 1971 to 1981. In 1970 he first visited India, where he and Young began studying with Pandit Pran Nath, and by the early 80s, Riley felt confident enough to perform ragas in public. His next soundtrack, “No Man’s Land”, added Bhatt’s tabla and sitar to Riley’s clean-focussed jazz riffs. A major piano cycle, “the Harp of New Albion” turned improvisation toward an almost impressionist experiment in modulating just intonation. Then David Harrington of Kronos began bugging Riley to write for the string quartet, and Riley eventually responded with an amazing series of quartets beginning with “Cadenza on the Night Plain” and extending most recently to a justly tuned Piano Quintet, and “Salome Dances For Peace”. These pieces are the core of a new, more classical phase: multi-movement works, rarely static, moving from motive to motive and texture to texture with a sense of spiritual journey. Now Riley’s writing a seven-movement orchestra piece for Leonard Slatkin to perform with the St. Louis Symphony, similar in style, he says, to “Salome”. Having successfully juggled an undefinable career among pop and classical, jazz and Asian, worlds, Riley is more sanguine than many composers about new music’s continued underground status, about the fact that official honors like the Pulitzer Prize and Grauwmeyer Awards still go to conservative atonalists like Mel Powell and Joan Tower. Part of “In C”‘s significance is that it granted American music a new starting point after the wartime arrival of Stravinsky, Schoenberg, and Hindemith on these shores suffocated the native experimental scene of the 30s. ” A lot of the music in America,” Riley notes, “that looks for its inspiration in world music, or jazz, or folk music, or even just natural sound, tends to be suspected of not being a highly elevated enough art form by the establishment that’s come out of European culture, where it’s considered that you have to have a certain X,Y, plus Z to make a form work. If anything points “Salome” back to Europe, it’s the highly motivic texture in a multi-movement form, though the modes are still clearly Eastern. Only a few years ago Morton Feldman theorized that multi-movement form was the one musical idea that was really dead in the late 20th century. “What I would consider dead,” Riley responds, “would be repeating myself, getting stuck in a place where I was just churning out pieces in a style. I feel like each thing I do should be something I haven’t worked with before. In that sense my model is the Beatles of the 60s, which I felt was a real high point in Western art. That’s what I want to do now, create a music out of all the materials I have available. “Pieces like “Rainbow” made from one motive–I don’t feel compelled to do anything like that recently. That’s not to say I don’t like it. I guess we don’t know the reasons why we do things. I always seem to be gaining one audience and losing another every time I write a new work. People say to me, “I liked the last thing you did, but I don’t like what you’re doing now. It’s like Miles Davis, a lot of people wonder what he’s doing. I’m sure no musicians are able to control what they do. We don’t have that much free will. We get interested in things, we keep trying to satisfy our souls and our desire to liberate ourselves through certain kinds of ideas. It’s not something where you’re in control; it happens to us. “As you’re working on a piece, an idea will come and you say, “Where did this come from?” You trust it. It might seem silly or not relevant to what you’re doing, then suddenly its meaning becomes apparent. That’s the exciting thing. We don’t have anything else in our life that’s quite like that. So if you think you’re in control [Riley laughs incredulously, gazing at the California hills for an answer], the game’s over. Riley’s concerts, part of the fourth annual Bang on a Can Festival, will be performed May 11 at eight and 10 at RAPP Arts Center, 220 East 4th Street. At the 10 o’clock show Khayal will be joined by the Kronos Quartet for a performance of “In C”. In addition, Kronos will give the New York premiere of Riley’s two-hour quartet “Salome Dances for Peace” May 12 at 8 in Alice Tully Hall. DORIAN REEDS (Mass Art, 1966): Early minimalish. Only 1000 copies made and half of them sent to Scandinavia. You’ll never find it. IN C (Columbia, 1968): Unremitting, 53 phrases played over a repeated pulse in the top two C”s on the piano. Rather harsh performance by the Center of the Creative and Performing Arts at SUNY at Buffalo. New Albion will soon issue another recording, which Riley prefers, with players from the work’s 25th anniversary concert in San Francisco. A RAINBOW IN CURVED AIR (Columbia, 1969): bouncy, psychedelic electronics, one of Riley’s most popular albums, “Manhattan became a meadow in which unfortunates form the Bowery were allowed to live out their fantasies in the sunshine and were cured.” The flipside’s “Poppy Nogood and the Phantom Band” is lovely but darker, more like “serious” 60s electronics. CHURCH OF ANTHRAX (CBS, 1971): With John Cale, this varies from hot jazz jamming to a rocked-up version of Riley’s sax improv, with one haunting Beatles-ish vocal. Harks back more than any other record to Cale’s static improvs with La Monte Young. PERSIAN SURGERY DERVISHES (Shanti, 1972): Smooth, two-record set of live modal improvisations, with tape delay in Los Angeles and Paris. HAPPY ENDING (WEA Filipacchi Music, 1972): Music composed for the film “Les Yeux Fermes” and, on the flipside, a piece called “Journey from the Death of a Friend”. This is the best source for Riley’s elegant soprano sax lines, electronically echoed. LIFESPAN (Stip, 1975): Original soundtrack of Alexander Whitelaw’s film “Le Secret de la vie”, containing Riley’s most easiest listening music and catchiest tunes. Mellow soprano sax over organ. SHRI CAMEL (Columbia, 190): Like the “dervish” records, but tighter. The purest and most concise of Riley’s keyboard solos, his improvisation-with-delay method honed down to four well-wrought vignettes. DESCENDING MOONSHINE DERVISHES (Kuckuck, 1982): Like “Persian Surgery”, laid-back improv over ostinatos and rhythmic cycles. It was recorded in 1975. SONGS FOR THE TEN VOICES OF THE TWO PROPHETS (Kuckuck, 1982) That’s “Prophets” as in the synthesizer brand. A mutual friend once told me, “We try to encourage Terry not to sing.” and the rough-hewn vocals make this one of the less ingratiating albums. Scintillating synth work, singing style half-Indian, half-Bob Dylan-before-his-morning-coffee. NO MAN’S LAND (Plainisphare, 1984): Krishna Bhatt’s tabla and sitar add more driving energy than usual to Riley’s modal jazz. THE HARP OF NEW ALBION (Celestial Harmonies, 1986): The piano is tuned to C# just intonation, but “The Orchestra of Tao” is in A-sharp, “Ascending Whale Dreams” in B-sharp, “The Magic Knot Waltz” in D. Result: every piece has a differently colored tonality, and the inspired playing blurs between Debussy and ragtime. Great disc for experiencing alternate tunings. SALOME DANCES FOR PEACE (Nonesuch, 1989): Introverted brooding work performed by the Kronos Quartet, near-Eastern as to mode elegant in its small glissandos, formally complex and wide-ranging. A difficult piece to carry individual impressions from, but texturally absorbing. IN C (Celestial Harmonies, 1989) Odd but delightful rush-through on chinese instruments with non-Western tuning, melodies out of order. Also nice minimalist-inspired pieces by David Mingyue Liang. -K.G. 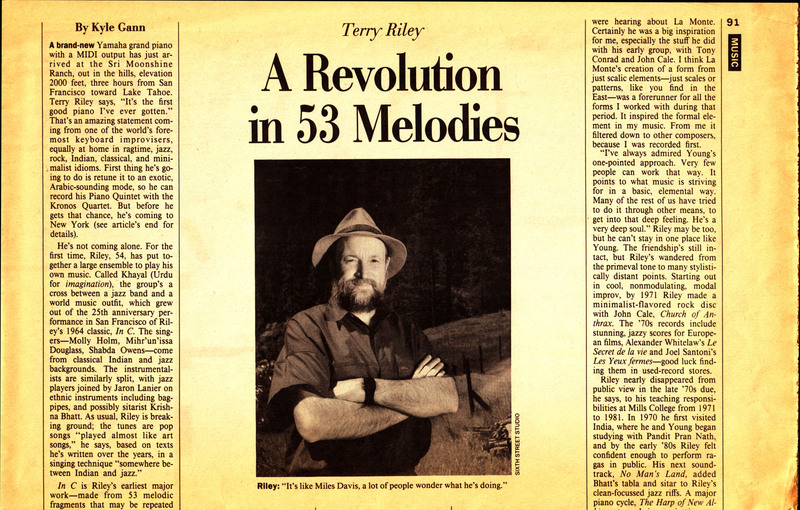 During the heady days of psychedelia and flower power in the 1960’s, Terry Riley suddenly found himself leading the life of a famous composer. His ”In C” (1964) garnered Minimalism its first public acclaim. And his ”Rainbow in Curved Air” (1968), with its brightly-colored electric keyboard arpeggios and wide-eyed hippie sentiments, attained genuine crossover status, linking classically oriented new music and progressive rock into a promising new synthesis. But in the 1970’s, Mr. Riley dropped almost entirely from view. While his Minimalist colleagues Steve Reich and Philip Glass achieved international fame, Mr. Riley ceased notated composition altogether. So complete was his disappearance that in the early 1980’s, when the Kronos Quartet finally coaxed him back toward musical notation, many listeners were shocked to discover that his new quartets sounded nothing like ”In C.” Could these pieces really be by the same composer? All in all, it is not a bad week for the 55-year-old composer, who has long enjoyed cult status as one of Minimalism’s founding fathers. Yet in the past Mr. Riley has been in the unenviable position of finding himself inextricably linked with a single, youthful work, ”In C”; none of his subsequent compositions have had quite the same impact. It is not hard to understand why. ”In C,” with its unrelenting pulse, clear tonal center, repeated melodic patterns and communally organized modular form, came as a breath of fresh air to an avant-garde that was suffocating under the weight of ultrarational, atonal Serialism. Nothing that has happened since in American Minimalism – not the music of Mr. Reichor Mr. Glass or John Adams – would have taken the same course if not for ”In C,” a fact that all thosecomposers readily admit. But Mr. Riley was never interested in exploring the abstract, systematic musical processes that came to fascinate Mr. Reich and Mr. Glass. Considering his background in jazz, it is perhaps not surprising that by the 1970’s he had stopped notating his compositions. 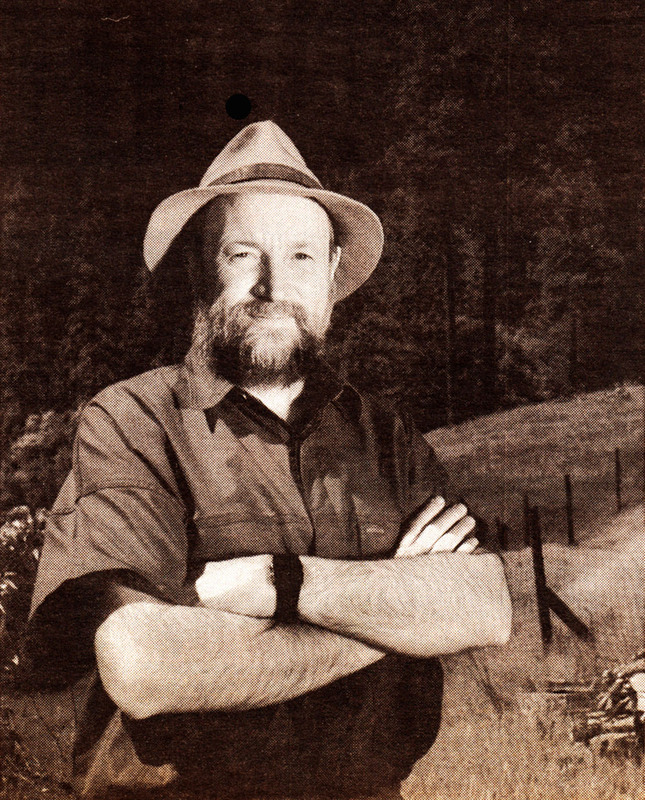 During a recent telephone interview from his remote northern California ranch, he said that that decision occurred partly because ”at the time there weren’t enough new music groups that were really dedicated to learning the music well.” But one also suspects that it occurred primarily because Mr. Riley’s heart lay with improvisation, a process he could work out much more easily as a solo keyboard performer than as an ensemble composer. Instead of feeling stifled by the notational process, Mr. Riley felt liberated. And he became obsessed with the string-quartet medium, one which offers the Western composer opportunities to inflect pitch in ways more commonly associated with non-Western music. By 1984, when he completed ”Cadenza on the Night Plain,” he had turned his back on the Minimalism of ”In C,” instead exploring sonic realms stretching from the long-breathed lyricism of North India to the spiky, fragmented development of Bartok. Originally conceived as a ballet in which Salome, reincarnated 2,000 years after her run-in with John the Baptist, would use her ”alluring powers to actually create peace in the world,” as Mr. Riley puts it in the liner notes, ”Salome Dances for Peace” grew into a loosely programmatic string quartet based largely on native American mythology. But if the mythic basis of ”Salome Dances for Peace” is cross-cultural, its music is even more so. During its two hours, the quartet mingles Asian modes, static drones, Arabic melodic arabesques and nontempered tunings – with dissonant Bartokian counterpoint, bluesy inflections, jazzy syncopations and Minimalist repetition. Despite the ease with which ”Salome” explores the process of notated composition – and despite a Carnegie Hall commission for an orchestral work, to have its premiere there next February by the St. Louis Symphony under Leonard Slatkin – Mr. Riley has no intention of turning his back on improvisation. His new nine-member ensemble, Khayal – drawing its name from the Urdu word for imagination – consists of singers, keyboards, winds, bass, percussion and a variety of ethnic instruments. And though the core of Khayal’s songs are composed, the working-out of those songs depends on group improvisation. La Monte Young, THE 51-YEAR-OLD American maverick composer, is often called the father of Minimalism, but one could make an equally strong case for him as the father of punk rock. If one is startled by the idea of, say, Philip Glass and Live Skull sharing the same roots, it’s because those roots have remained hidden below ground. For 30 years, La Monte Young’s music has been more heard of than heard – unavailable on records except for the rare limited edition or import, infrequently performed. But this situation is about to change dramatically. A 30-year retrospective concert series began March 29 with a performance by the composer of his “Well Tuned Piano” at the Dia Art Foundation Performance Space, 155 Mercer Street. The concerts will continue at Dia through May 21 and will include performances of rarely heard works for brass, strings, guitar and other instruments. 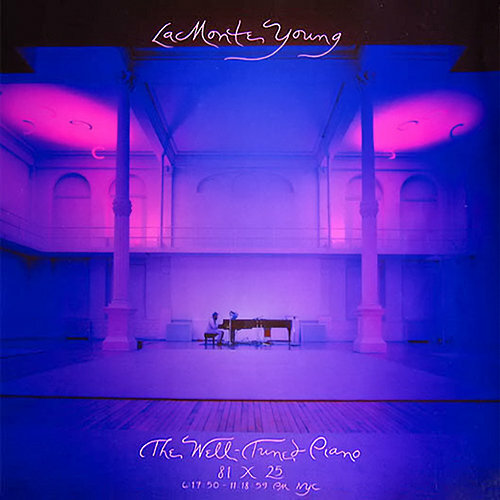 And later this month Gramavision plans to issue a splendid recording of “The Well Tuned Piano,” a continuous five-hour performance by Mr. Young on a specially retuned Bosendorfer Imperial, as a five-record boxed LP set and in cassette and CD formats as well. Some longtime Young-watchers suspect that he might still be perfecting his music and biding his time if a generous chunk of the art-world funding he has long enjoyed had not dried up a few years ago. The Dia Art Foundation, funded principally by Houston oil money, had purchased the former New York Mercantile Exchange building on Harrison Street and revamped it to serve as a permanent home, gallery, archive and performance space for the composer. But the foundation ran into financial problems and was forced to sell the building. Mr. Young and others then formed the MELA Foundation, which is presenting this spring’s concert series, to help support his work. He admits the change in his fortunes was an impetus to activity, though the negotiations for release of “The Well Tuned Piano” had already been under way before Dia’s problems. But whatever the motivations, La Monte Young’s finally stepping into the spotlight is a notable, long-awaited musical event. Musically, as well as in career terms, Mr. Young has always taken his time. His Trio for Strings, to be performed in concert on May 18, takes five minutes to present the first four notes. During the 1970’s, he set up a series of “dream house” sound installations in galleries and lofts, with drones sounded by fixed-pitch electronic sine-wave generators. The composer and his performing group, which at one time or another included such future new-music luminaries as Terry Riley, Jon Hassell, Jon Gibson and Garrett List, as well as Mr. Young’s wife and longtime collaborator, the visual artist Marian Zazeela, would show up from time to time to play long tones along with the drone, but the “dream house” itself was theoretically eternal. Essentially, Mr. Young has developed an alternative harmonic theory that enables him to modulate, if not into different keys in the strict sense, then into different harmonic areas, in what is essentially a monochord or drone tuning, geared for maximum resonance. During the busier sections of ”The Well Tuned Piano” the entire instrument reverberates, the interacting sounds seeming almost to solidify into a cloud above the open piano lid. The phantom French horns, strings, and massed choirs that many listeners initially dismiss as quirks of hearing are in fact intentional, precisely calibrated effects. Perhaps for the first time, a pianist does almost literally have an orchestra at his fingertips. For a time, these early sonic influences were overshadowed by a love affair with the saxophone, which Mr. Young began playing at the age of 7, with his father as his first instructor. He became a proficient jazz saxophonist, and in the mid-50’s was heard widely around Los Angeles, sometimes as leader of a group that included the future jazz greats Don Cherry, Billy Higgins and Dennis Budimir. Surviving tapes capture an alto saxophonist with a marked affinity for the progressivism of such players as Lee Konitz and Warne Marsh, but with a harder, slashing edge to the sound and an even more convoluted approach to phrasing. During this period, a teacher, Leonard Stein, introduced him to the music of Debussy, Schoenberg, Webern, Boulez and Stockhausen, and his interest in the saxophone was gradually subsumed by a passion for composition. His early pieces were serial in nature, but the interest in long tones and silences that survived from his childhood began to manifest itself early on. Following his development from “Five Small Pieces for String Quartet” (1956) and “For Brass” (1957) through the 1958 “Trio for Strings,” one can hear the extreme compression and purity of Webern interacting with the childhood influences that shaped his way of hearing sounds, the result being a radically original style. After studies with a succession of teachers, including Karlheinz Stockhausen (at a Darmstadt seminar) and the innovative electronic composer Richard Maxfield, Mr. Young settled in New York and became involved with a group of ambitious young artists who pioneered mixed-media presentations and became known collectively as Fluxus. He organized the first Fluxus concert series, which was also New York’s first series of downtown loft concerts, held at Yoko Ono’s Chambers Street loft in 1960. Mr. Young’s detractors in the music world, and there are some, have suggested that no single composition, however grand in theory and design, needs to germinate for 20 years or more. They wonder if the years spent studying Indian music from the ground up with Pandit Pran Nath might have been better spent diversifying his composing. But then, back in the 60’s, the Velvet Underground had its detractors, people who said the sound was more noise than music. The Velvets’ reputation has survived the criticism handily, with the help of the band’s body of recorded work. 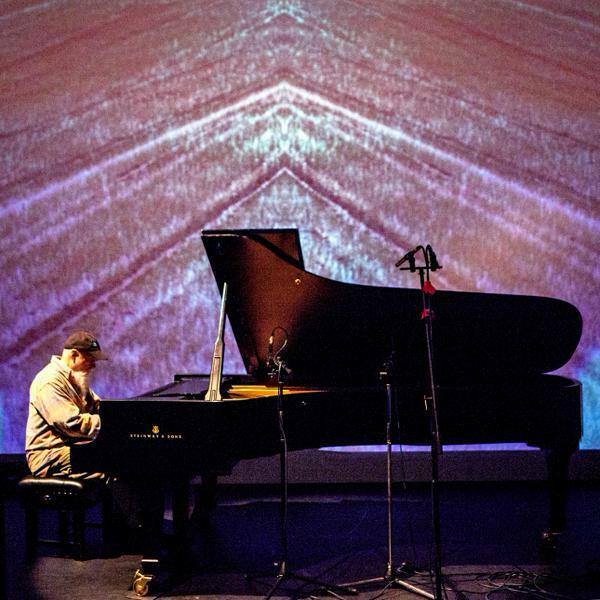 The Gramavision recording of “The Well Tuned Piano” captures the diversity and depth of La Monte Young’s musical vision, now more nearly maximal than minimal, with superb clarity. There are passages of ravishing lyricism, as delicate as any minimalist piano solo, even if the tuning may initially sound odd to some. There are also stormy welters of sonic interference patterns, as bracing as the Velvets’ screaming feedback surges. “The Well Tuned Piano” isn’t so much a single composition as a formal and intuitive synthesis of everything Mr. Young has done. His music was already controversial while it was still in the process of creation. Now it is going to be heard, and it’s about time.